Air flows in through the dual-filtered air intake plenum (located in the ceiling toward the front of the booth) downward through the work area and exits through the exhaust plenum located in the rear of the booth. Filtered exhaust air is drawn through the exhaust plenum and discharged upward into the atmosphere via the exhaust stack. 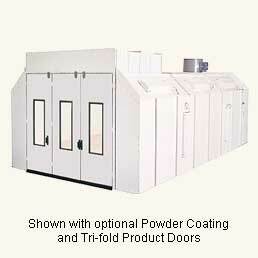 This booth is provided complete, with all necessary hardware to meet the applicable national requirements established by OSHA and the NFPA for paint booth construction.